Free Shipping Included! 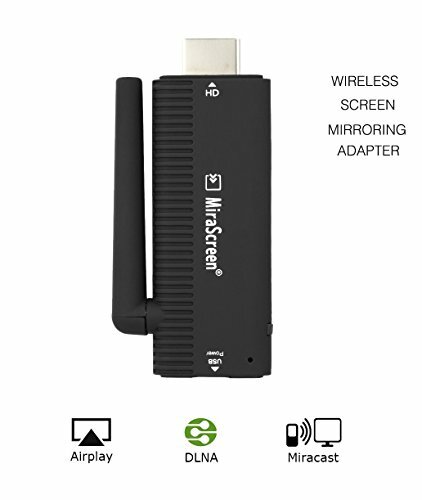 MiraScreen WiFi Display Dongle 1080P Wireless HDMI Adapter MiraCast Airplay DLNA Streaming Cast Screen from iPhone iPad Android Devices to TV Projector by MiraScreen at AABX. MPN: B4. Hurry! Limited time offer. Offer valid only while supplies last. Easy to use: No app or drivers required , only 3 steps to share the screen: Plug->Connect->Mirroring by using Miracast, DLAN and Airplay agreement. The reinforced signal cable and External WiFi antenna make the HDMI stick receiving more stable signal with zero latency. Good compatibility: Support Smartphones and tablets (Samsung, Huawei, Xiaomi, Sony, iPhone, etc) with Android 4.4+ and iOS 8.0+. The dongle can be updated online and still works when your smartphone or tablet is updated. Car Wireless HDMI Transmitter : Also can be used as Car WiFi Display, just connect it (powered by 5V 1A) to Car HDMI port, this dongle will cast multimedia contents, GPS Navigation from Smart Phones to the car monitor. Traffic jam time is no longer boring.